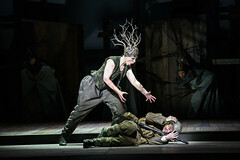 British director David Pountney made his Royal Opera debut in 1974 as revival director for Jenůfa, in a production originally directed by Christopher West. He returned in 1976 as assistant producer to Hans Werner Henze for his We Come to the River, and has since directed productions of The Greek Passion and Maskarade for The Royal Opera (originally created for Bregenz Festival) and the world premiere production of In Parenthesis for Welsh National Opera. In the 2016/17 Season he returned as translator for The Nose, directed by Barrie Kosky for The Royal Opera. Pountney joined Scottish Opera in 1970 and came to prominence in 1972 with his production of Káta Kabanová for the Wexford Festival. He was Director of Productions for Scottish Opera 1976–80 and of English National Opera 1982–93, and Intendant of Bregenz Festival 2003–14. He has been Chief Executive and Artistic Director of WNO since 2011. His many productions include Rusalka, Osud, Wozzeck, Don Carlos, Falstaff, The Adventures of Mr Brouček and Nabucco (ENO), Khovanschina, Lulu and The Cunning Little Vixen (WNO), Guillaume Tell and Jenůfa (Vienna State Opera), Faust (Bavarian State Opera), Turandot (Salzburg Festival), Die Frau ohne Schatten and Prince Igor (Zürich), Carmen (Bolshoi Theatre), Die Zauberflöte (Bregenz Festival) and Der Ring des Nibelungen (Lyric Opera of Chicago). He has directed many world premiere productions, including The Voyage (Metropolitan Opera, New York), Mr Emmet Takes a Walk (Orkney Festival), The Passenger (Bregenz Festival), Kommilitonen! (Royal Academy of Music), Spuren der Verirrten (Linz) and Elysium (Norwegian National Opera). He is a CBE, a Chevalier in the Ordre des Arts et Lettres, has the Cavalier’s Cross of the Order of Merit of the Republic of Poland and was awarded the Ehrenkreuz des Bundes Osterreich in 2014.